Chlorophytum or spider plants are some of the most easy-to-care-for and versatile houseplants available. They’re perfect for the novice gardener, the casual enthusiast, or even those of us with a black thumb. They can survive in a wide range of environments, and you won’t lose them if you forget to water them for a week (or a month). Spider plants can be grown hydroponically or in the soil. In this article, we will be mainly focusing on how to grow them in potting soil. One of the most incredible things about spider plants is their ability to grow and survive in both dark and light environments. They prefer bright sunlight, but they will scorch in harsh, direct light. Keeping them somewhere with partial sun to partial shade will make for a happy plant. These plants prefer a temperature range between 55 and 65 degrees Fahrenheit, but they will tolerate warmer temperatures for short periods of time. Letting the temperature fall below 50 or exposing them to cold drafts is not recommended. When growing your spider plants in soil, be sure to allow the dirt to dry out between watering and keep them in a drained pot if possible. Unlike many other plants, these guys like to be snug in their pots and only need to be moved when the tops of their roots begin to show at the surface. Spider plants get their name in part from their babies or spiderettes. These tiny offshoots resemble little spiders dangling from gossamers, and they are the primary reason chlorophytum make such beautiful hanging plants. Springtime and early summer are when a mature mother plant will typically start to bloom, putting out tiny white flowers. Once the flowers fade, little bunches of leaves will begin to sprout as the spiderettes emerge. Once the spiderettes have had time to grow and develop root nubs at the base of their leaf clusters, they can be cultivated for potting if desired. One method of preparing the babies is to keep them on the mother’s stem and plant them in a small pot, keeping it well watered until the little plant has taken root, at which point it can be cut from the mother plant. Another method is to place the plantlet in water that has been mixed with a small amount of fertilizer or root stimulant. This method works well if you cannot keep the baby attached to the mother plant while it is rooting. As one of the most forgiving houseplants on the market, spider plants can be arranged in many different ways. A standard method of display is to grow them in a hanging basket, letting the babies trail down. Another elegant way to display them is to put the mother plant in a simple bowl and place it on top of a column, shelf, or ledge where the tendrils can hang down over the edge of the surface. 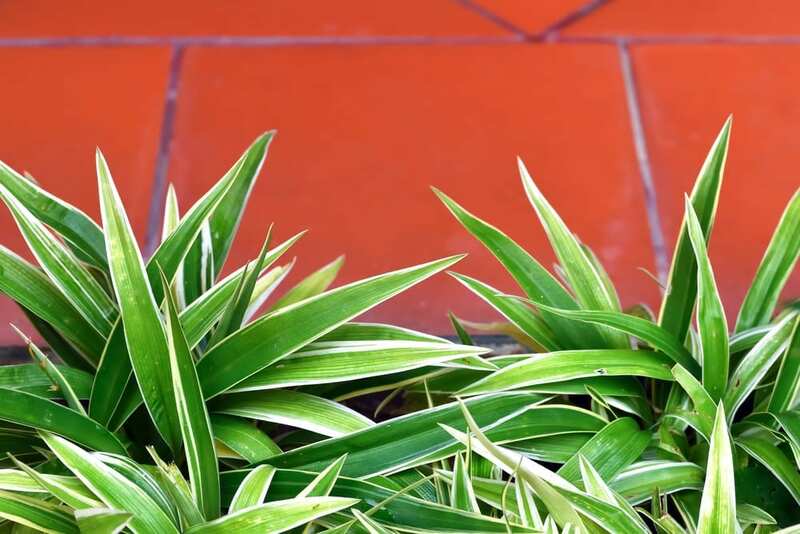 Chlorophytum is most commonly found in its variegated form, but a solid green variety does exist. Some cultivars also feature more prominently curled leaves. These curled plants make excellent additions to any bookshelf when planted in tiny, decorative containers. However you choose to display your spider plants, they’re guaranteed to brighten up any living space.